I think I may be a bad blogger. When I first started my blog over 2 1/2 years ago everything seemed exciting and new. There were things to learn, new blogs to read and the Internet wasn't completely saturated by 5,000 different social media possibilities to waste endless amounts of time. I blogged everyday, sometimes more than once. If I missed a day I would write twice as hard the next. Fast forward almost 3 years and I feel a little blah. I miss more blog posts a week than I would like to admit. My blog almost feels like a chore some nights. After chasing after two very active boys my blog seems a little less important than it was when my youngest had just turned two. Next month my youngest will be 5 and my oldest will turn 8 this spring. They were babies when my blog started, my oldest hadn't even started school yet. Part of my blog taking a back seat is coming naturally with age, as my kids and I get older I feel less compelled to sit behind a computer and not interact face to face. My mother started having serious health issues in her 40's and I try my hardest to avoid this fate. Part of that plan means spending less time on the computer and more time with friends and family. It also means instead of computer time, I am remembering the joy of a good book or a movie snuggled up with my husband. I don't know where my blog will be in another 2 1/2 years. It has evolved endlessly since I started it. So if you don't see me posting everyday it isn't that I have forgotten about my blog, readers and food. It's just that life has a way of becoming more important during certain periods of our life. I do promise that the posts that I end up having the time to write will be truthful and hopefully an enjoyable read. I have been trying to make sure that my two boys eat at least a small breakfast every morning. They both have a bad habit of skipping breakfast or choosing cereal and then becoming cranky a couple of hours later. In order to combat this problem I have been trying a number of new breakfast recipes. Last week I tried a new recipe for Hearty Blueberry Muffins from Martha Stewart Living magazine. This recipe has 10 ingredients. It takes an hour of total time, 25 minutes of which is active and makes 12 servings. I only made a few changes to the original recipe. First, I used coconut oil for the fat. Coconut oil is nice since it keeps for a very long time and turns into a solid when cool and a liquid when heated. Plus it doesn't have a strong flavor so it's great for baking. My two boys had eaten a bunch of my blueberries by the time I made this recipe so my muffins were not as full of blueberries as the original recipe. Finally, I used foil baking cups, I love them they are so much easier to get the muffins out of than regular paper liners. I like that these muffins have both wheat germ and whole wheat flour. My boys liked that they had blueberries and were sweet and didn't notice that they also had added nutrition. They kept well on my counter and with a couple of seconds in the microwave tasted like they were fresh baked (according to my boys). Overall a nice breakfast option that is kid friendly. For the recipe go to Hearty Blueberry Muffins. 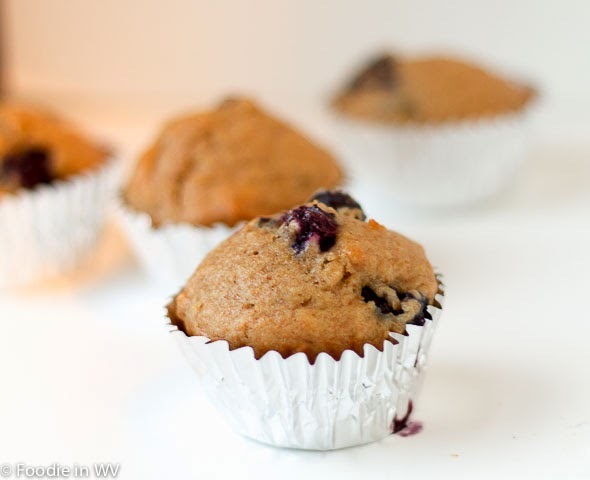 A blueberry muffin recipe using coconut oil, wheat germ and whole wheat flour. A nice way to start the day! I get into slumps every now and then. Sometimes I just don't have anything to write about, but I usually turn to my husband and ask for ideas when that happens LOL. A classic favorite, and with good reason. I totally understand how you feel, I'm new to blogging but I really underestimated the time commit that it takes to maintain a blog and find new readers through various social media platforms. A lot of really great bloggers only post a couple of times a week. Enjoy your family, your readers will understand. Your kids are so lucky, the breakfasts that you mention on facebook always sound great. These muffins look scrumptious, Ann. Thanks :) My kids really liked them! The muffins sound really good. I think blogging has to evolve with your life and your needs; if you don't feel you're getting as much from blogging anymore, it seems perfectly reasonable to change your relationship with it. For me, blogging was actually something I turned to when the other social media (esp. Facebook) began to feel overwhelming and because I felt having my own blog would give me a place to really be who I am; many of my FB "friends" are a bit disrespectful of my interests and I was getting tired of feeling like I had to justify myself. I agree with you on Facebook. Facebook can be very overwhelming and a lot of people are more than a little disrespectful of other peoples opinions. I'm glad that your blog has given you the outlet that you were looking for. It's always important to be yourself and not have to worry about what other people are going to think/say. I enjoy your blog and look forward to your new recipes! Thanks, blueberry muffins are always a hit in my house!